Home / Blog / Does Your Home Have a Humidity Problem? Humidity is best understood by the concept of “relative humidity,” which is simply the percentage of water vapor in the air at a certain temperature compared to the amount of water vapor the air is able to hold at that specific temperature. For instance, when air at a specific temperature holds all of the water vapor that it is capable of holding (at that temperature), the relative humidity is 100%. In the same way, if air (at a specific temperature) holds a quarter of the water vapor that it is able to hold (at that specific temperature), the relative humidity is 25%. Because a healthy humidity level is between 30-50%, there are problems associated with too much or too little moisture in the air. Perhaps you’ve experienced static electricity, dry or chapped lips, a scratchy throat or itchy skin in the winter months. This is most likely due to a low humidity in your home. The body loses moisture quickly in environments with low humidity, increasing one’s susceptibility to colds and respiratory illness. Surprising to some, components of one’s home changes in response to low humidity as well. Homeowners may notice that their wood floors become warped, or that their piano goes out of tune. In turn, wallpaper may begin to peel along the edges, and wooden drawers may loosen. 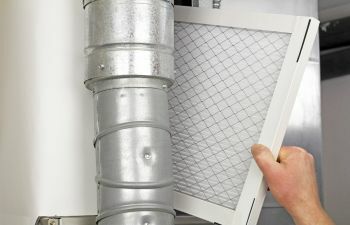 On the other hand, high levels of relative humidity in a home certainly pose a risk for those with pre-existing heart conditions, as well as those with allergies or asthma. In regards to one’s home, condensation becomes a concern in areas of high humidity, along with wood rot, mold, structural damage and pests. Family-owned and operated, ClimateSmith, LLC maintains a reputation for top quality heating and cooling services for the Atlanta metro area. When it comes to humidity levels and your AC system in your home, residents continue to rely upon our licensed and insured specialists for first-rate service and care. Why? It’s simple—your comfort matters to us. Call today!